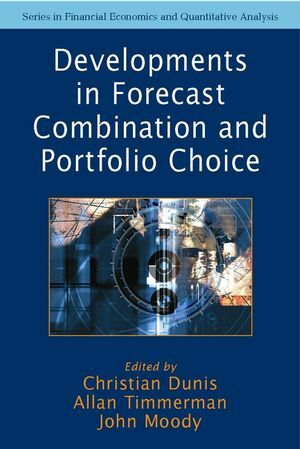 Developments in Forecast Combination and Portfolio Choice focuses on the following three themes: model and forecast combinations; structural change and long memory, controlling downside risk and investment strategies. Written by leading international researchers and practitioners, his book deals efficiently with three key questions facing portfolio managers. How to achieve greater forecasting accuracy; how to deal with structural change in asset allocation models and how to control downside risk, i.e. the risk of loss, in portfolio management. CHRISTIAN L. DUNIS is Girobank Professor of Banking and Finance at Liverpool Business School, and Director of its Centre for International Banking, Economics and Finance (CIBEF). He is also a consultant to asset management firms and an Official Reviewer attached to the European Commission for the evaluation of applications to Finance of emerging software technologies. He is an Editor of the European Journal of Finance and has published widely in the field of financial market analysis and forecasting. ALLAN TIMMERMANN is Professor of Economics at University of California, San Diego. He is on the editorial board of the Journal of Forecasting and Journal of Business and Economic Statistics. His research is concerned with modelling the dynamics and predictability of returns in financial markets. Professor Timmermann has held positions at Birkbeck College and the London School of Economics. JOHN MOODY is the Director of the Computational Finance program and a Professor of Computer Science at the Oregon Graduate Institute. His research interests include computational finance, time series analysis and machine learning. Professor Moody has held positions at Yale University and the Institute for Theoretical Physics. What Exactly Should We Be Optimising? Criterion Risk in Multicomponent and Multimodel Forecasting (A. Neil Burgess). A Meta-parameter Approach to the Construction of Forecasting Models for Trading Systems (Neville Towers and A. Neil Burgess). The Use of Market Data and Model Combination to Improve Forecast Accuracy (Christian L. Dunis, Jason Laws and Sté phane Chauvin). 21 Nonlinear Ways to Beat the Market (George T. Albanis and Roy A. Batchelor). Predcting High Performance Stocks Using Dimensionality Reduction Techniques Based on Neural Networks (George T. Albanis and Roy A. Batchelor). Structural Change and Long Memory in Volatility: New Evidence from Daily Exchange Rates (Michel Beine and Sé bastien Laurent). Long-run Volatility Dependencies in Intraday Data and Mixture of Normal Distributions (Auré lie Boubel and Sé bastien Laurent). Comparison of Parameter Esitmation Methods in Cyclical Long Memory Time Series (Laurent Ferrara and Dominique Guegan). Building a Mean Downside Risk Portfolio Frontier (Gustavo M. de Athayde). Implementing Discrete-Time Dynamic Investment Strategies with Downside Risk: A Comparison of Returns and Investment Policies (Mattias Persson). Portfolio Optimisation in a Downside Risk Framework (Riccardo Bramante and Barbara Cazzaniga). The Three-moment CAPM: Theoretical Foundations and an Asset Pricing Model Comparison in a Unified Framework (Emmanuel Jurczwnko and Bertrand Maillet).